This article was published electronically August 14, 2014 in the Energy & Environment News Service and is re-printed here with permission from the reporter. Four years ago, a Wisconsin Republican urged his party to overcome its fear of environmental action, saying that a conservative green movement could strengthen both the economy and GOP candidates. Then he got clobbered. Now his son is taking a turn. Matt Neumann hopes to convince state officials that Wisconsin needs a big expansion of solar power. Among his audience are members of the Republican Party including friends of his father, former U.S. Rep. Mark Neumann, who was later defeated in back-to-back primaries, first for governor in 2010 and then for the Senate two years later. The younger Neumann resembles his dad, a former math teacher, both in looks and in his conspicuous conservatism. They both promote the environment, and they hope to make money conserving it. They do have one big difference: "Politics drives me nuts," Matt Neumann said. Instead of running for public office, he's making his energy pitch as president of the Wisconsin Solar Energy Industries Association and as the co-owner of a solar installation business that he runs with his father. The key reason behind Wisconsin's sluggish growth is opposition by its utility sector, according to advocates of renewable energy. Utilities like We Energies, Wisconsin Public Service Corp. and Madison Gas and Electric Co. are pre-positioning themselves to avoid potential future losses from homegrown power, like solar arrays, by seeking fixed rates rather than charging customers for the amount of energy they use. That can discourage conservation, clean energy advocates say, and it might dampen the economic impetus for installing solar on your rooftop: If a customer can't lower his or her power bills by using solar electricity, then the investment doesn't make sense, advocates say. Neumann uses conservative touchstones to describe the state of things. For him, it's a lack of "liberty" that prevents a property owner from choosing how to power his or her home or business. He said this absence of "energy choice" contradicts Republican tenets, which run strong in a state where the governor, Scott Walker, is favored by the tea party. "We're very conservative here in Wisconsin," Neumann said. "The reality is free market capitalism, the choice to choose how you buy your energy, and how you finance that acquisition, the ability to lower your long-term energy costs -- those are all very conservative principles and yet for some reason we're struggling to adapt." Rate proposals currently being considered by the Wisconsin Public Service Commission would increase fixed monthly costs from $9 to $16 for customers of We Energies, the state's biggest utility. Bigger jumps are being sought by Wisconsin Public Service Corp., which wants to double the fixed costs for residential customers to $25, and Madison Gas and Electric, which proposed a monthly fixed fee of $68 by 2017 before settling for $19 next year. That's an 82 percent jump. We Energies is also asking regulators to allow it to pay much less for electricity generated by homeowners, who can sell excess power derived from solar panels and other systems to utilities. The company is seeking to decrease the current price of 14 cents per kilowatt-hour to between 3 and 5 cents. Cathy Schulze, a spokeswoman for We Energies, said the current price is above market rate, and the cost is passed on to other ratepayers. She also said the utility is moving to fixed prices to ensure that customers without solar aren't required to shoulder more of the costs of maintaining the grid's infrastructure -- like poles, wires and utility employees. "The costs are shifting to those people who don't have their own generation right now," Schulze said. "It may not be as big of a problem right now, but as that [solar] industry continues to grow, you're going to see that disparity and that cost grow wider." Others see it differently. Tyler Huebner, executive director of RENEW Wisconsin, which advocates for cleaner power, said that the utilities are trying to cover recent investments in coal and gas plants with higher fixed fees. Customers shouldn't be tied to the cost of those plants, he said, if they find cheaper, cleaner power alternatives. If the buyback rate for excess solar power drops from 14 cents to 4 cents, it would price solar systems out of the marketplace, he said. "That's the concern," Huebner said. Neumann said solar could thrive in Wisconsin if lawmakers would clarify that third-party ownership of solar systems is allowed. His company is an example. 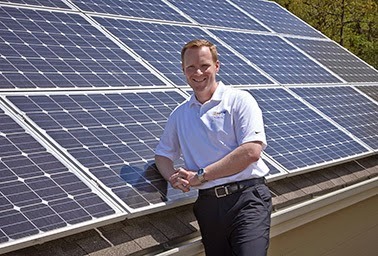 SunVest Solar Inc. installs its own photovoltaic systems on homes, businesses and churches, and then sells the power to the property owner at a fixed rate over 20 years. The rate is usually equivalent to the cost of conventional electricity, or lower, Neumann said, and it can expand the use of solar power because property owners don't have to buy the equipment, which can cost up to $15,000 installed for a home. He's hopeful that Wisconsin lawmakers will pass legislation allowing third-party financing. But he said the "big thing" that Republicans will have to overcome is the utilities' argument that solar could increase the cost of electricity on those customers who don't have it. "It's just plain not true," Neumann said, noting that solar power cuts cost on utilities and customers by generating power at peak demand periods. But the utilities seem to have the ear of lawmakers. State Sen. Robert Cowles, a Republican and chairman of the Energy, Consumer Protection and Government Reform Committee, said the idea that solar could shift the cost burden to other people is "pretty compelling." "I can tell you, the utilities are vehemently against this," Cowles said of third-party ownership. "I'm not sure how we would get them to ever accept that. We would have to overwhelm them somehow. I mean, I'm not taking a position on this right now." Neumann, like his dad, is a conspicuous member of the Republican Party. As he emphasizes renewable energy, his party avoids it. The state GOP's platform, adopted this year, doesn't prioritize cleaner energy, or even mention it. Instead, the document promotes eliminating the Department of Energy and encourages environmental stewardship based on technology rather than "unnecessary government regulation." Neumann's father, favored by some tea party groups during the primary for governor in 2010, pushed his party to expand its reach with young voters and others "put out from the Republican Party," by mixing environmentalism into the GOP's economic messaging. Among the ideas that Mark Neumann introduced in 2010 was a job-friendly plan to reduce carbon emissions. "When I talk about the environment, that's an issue people have been afraid to talk about on our side of the aisle," he said at the time, seated beside future Gov. Scott Walker, a conservative Republican. Neumann lost badly in the primary several months later as Walker sailed away with a 20-point victory. For his part, Matt Neumann may stray from his party's bosom, but he doesn't abandon it. He looks at environmentalism through a lens of commerce. Pursuing it can enhance economic activity and provide jobs, he seems to say, but it's unclear if environmentalism is an exclusive priority for him without the fiscal hangers-on. He also treads carefully when asked about climate change. He declined to say if it's occurring, something that might perhaps give him credibility when talking to conservatives about renewable energy. "I don't know on climate change," Matt Neumann said. "I have no idea. I would have to study it a lot more -- and probably should, given the industry we're in." "I'm being totally honest with you -- I just plain don't know." Click here to start a free trial to E&E -- the best way to track policy and markets.